If you are a downtown-dwelling Naptowner, an image probably comes to mind when that ghostly, 10-story building on the corner of Market and Illinois Street is mentioned. What you may not know is the history behind it: the Illinois Building was the zenith of elegance during the Roaring Twenties. 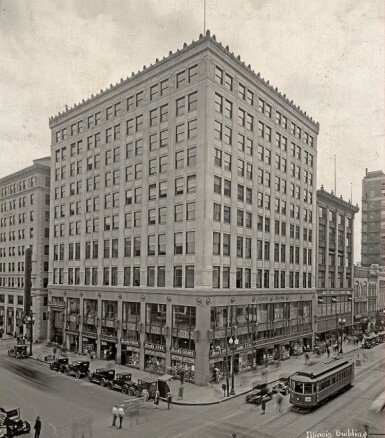 Only the fanciest stores qualified for first-floor tenants, and the building was geared towards “high principled men” according to a 1925 ad. Long story short, the Illinois Building’s troubles began during The Great Depression, and the structure has struggled to survive since then. The once luxurious building, constructed in 1924 with Italian marble, African mahogany, limestone reliefs, and terrazzo mosaics was put on Indiana Landmark’s “10 Most Endangered” list in 2006 due to its abandonment. Its future was uncertain. Would it be razed? Added onto? Or worse….demolished? We decided we couldn’t let a piece of Indy’s history disappear, and we were up for the challenge of becoming the developer and restoring the Illinois Building to its former glory. We are currently renovating the entire building from top to bottom. The whole enchilada: refurbishing the bronze lights, inserting staircases, pulling back electrical and plumbing, you name it. A central goal of Keystone Realty Group’s is to enhance the lives of community members through our projects. What better way to do that than to introduce a new social hotspot on one of the busiest corners downtown? This mixed-use structure will have a ton of functions in the future, but guests can enter the property in the next two weeks with the opening of the famous Giordano’s Pizza on the first floor. Renovating a historical building brings one challenge after the other, but Keystone Realty Group used its expertise and resources to finish Giordano’s on time so the public can devour that Chicago-style pizza pie ASAP! We can’t wait to continue updating you on how The Illinois Building project develops, and how we want to make life downtown more fun. Giordano’s is the first step in this process. Stay tuned! 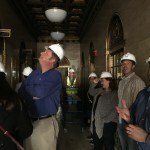 The Keystone team on a property tour through the Illinois Building. Notice the art deco detailing on the elevators. 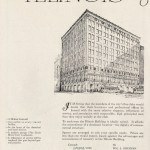 A 1920’s ad markets the Illinois Building as an upper-class mecca for businesses, stores, and businessmen. 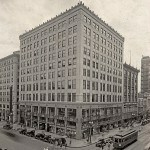 The Illinois Building in it’s infancy circa 1926.